In our last episode, Derek’s friends seemed pleasantly surprised to see that he appeared more exuberant and became happier. His life became more fruitful and colourful ever since he went to a place where he found a new family. In this third and last episode of the mini-series, let us discover the place where he was embraced by the warmth of his family. The place where he calls a second home. Want to experience our warmth? Come down and join this family! Also, do remember to keep checking our hashtag #discoverNUSTM to understand why NUS Toastmasters Club is a family. Meet Derek, the changed man. Now, he is much more confident and radiates optimism. What do you think are the reasons for his progress and empowerment? Check out our hashtag #discoverNUSTM on Facebook to find out more! Meet Derek. His life changed for the better when he found hope and had the courage to take the first step. Curious to find out the reasons for his empowerment? Can’t wait to find out why he transformed? Like and share this video now so that the next scene can be shared! When it comes to Public Speaking, crafting a good speech is half the battle won. If you are looking to improve your ability to craft better speeches and to master the techniques of impromptu speaking, come on down and join us on the 4th or 5th of October for our Speechcraft workshop! 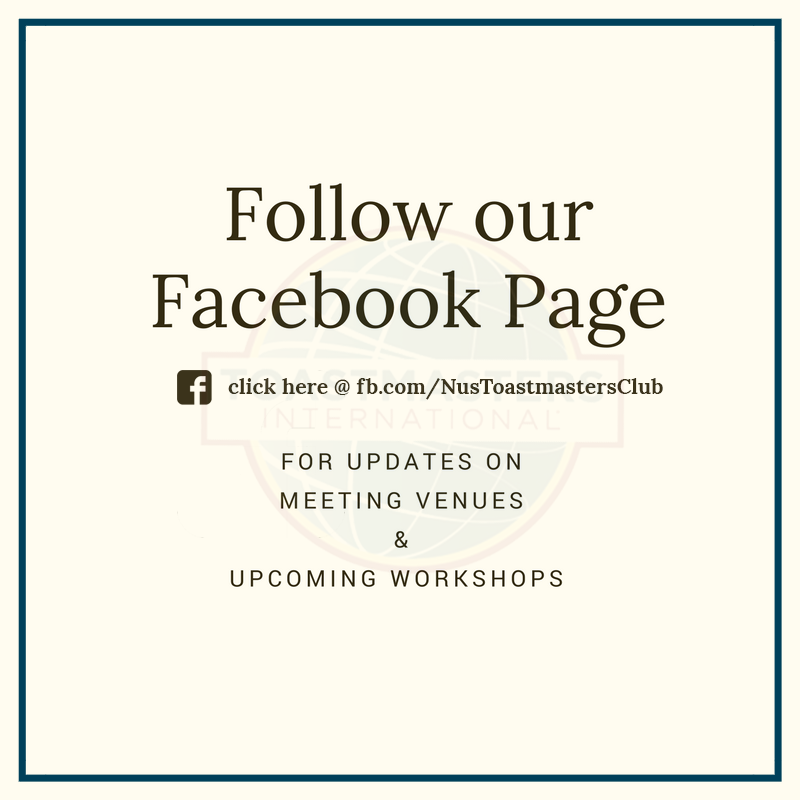 Do note that there is a $20 fee for non-members to attend this workshop and as always, workshops held by NUS Toastmasters are free for members. Why are you still reading this post? Sign up now at http://bit.ly/NUSTMCSpeechcraft ! THIS WEEK IS OUR ANNUAL GENERAL ELECTIONS! Come and vote for your new executive committee and find out what the previous executive committee has been up to for the past year. This will be very exciting as there are many contenders this year! As before, if you would like more information or have issues with Membership, please contact the following personnel. Good evening all, this coming chapter meeting, we have several guests coming this chapter meeting so be on the lookout for our exciting new guests. They come from the land of SIM, and definitely they have great speakers :). For a new experience, come join us! Good evening all, today we have our weekly normal chapter meeting. Last month was a tumultuous month, with Speechcraft 2014 as well as our International Speech Contest 2014! here are the winners for the International Speech Contest!! Lim Zhen and Kannan will be representing NUS Toastmasters Club in the Area International Speech Contest coming soon! This coming Tuesday is just a regular chapter meeting, but, fret not. It will still be very interesting, as we will have visitors from other clubs who will have much speaking experience who will share with you all they have learnt, so be sure to listen closely! 25th February 2014 – International Speech Contest Finals! Remember last week where we were all memorised by Zhen’s and Nat’s speech? will be competing to see who is the best speaker in our club. Do come down to support them! They will be needing it. Personally, I have seen all of them speak, and boy! I can tell you that there is NO clear winner. 18th February 2014 – International Speech Contest! 18th February 2014 is the date where our international speech contest for NUS Toastmasters Club begins! Head on down to see how our contestants speak their way to the top!